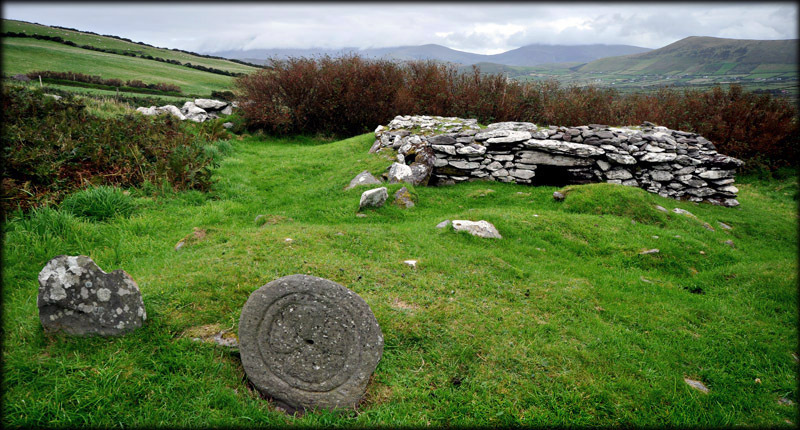 This early Christian settlement is situated on the slopes of Croaghmarhin mountain. The southern side of the 68 metre enclosure is dissected by a modern roadway. 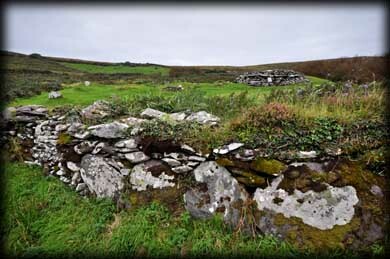 In the eastern sector are the remains of an early drystone oratory. The east wall is almost completely collapsed and the other walls vary from 0.5 to 0.9 metres in height. Although the interior is mostly filled in, it is still possible to make out the internal size of the oratory. 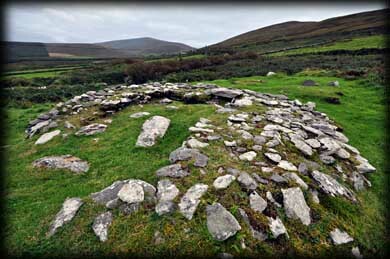 In the image below you can see a holed stone to the right of the entrance that acted as an upper pivot for the door. The original roof would have been corbelled. 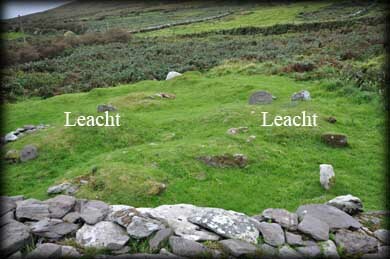 Immediately west of the oratory are two mounds that mark the location of two leachts or stone altars. The shape of the northern leacht is more defined. Further west of these stone altars you can see the upper portion of a Cross slab. 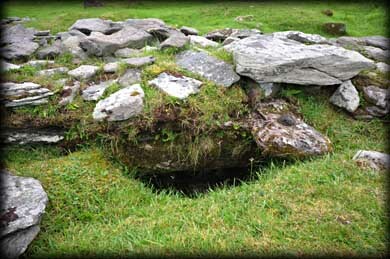 The shaft of the slab is deeply buried in the ground but it still stands about a metre above ground level. 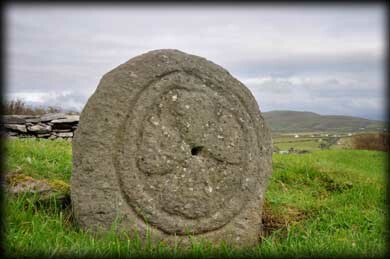 It is decorated on both sides with a Maltese cross within two circles. There are holes present in the centre of the cross on both sides but they are not perforated. 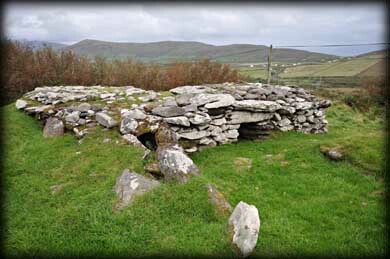 The presence of grave mounds in the northern section of the enclosure suggests it was used as a calluragh burial ground. 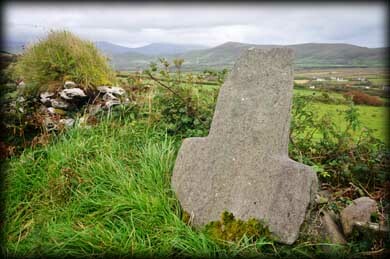 On the southside of the road to the east of the enclosure is a 1.23 metre high plain stone cross, pictured below right. Like the slab, most of the shaft is buried below ground. The views of the valley from here are quite stunning. Situated: From Ballyferriter village turn left at the Church, opposite the Museum. Drive for 1.6 kilometres. If you should see a ruined stone wall on your right. You are inside the enclosure. Discovery Map 70: Q 3529 0348. Last visit Sept 2012.